So there's a new Marvel Cinematic Universe movie coming out next year. It looks pretty rad. The trailer for the film hit the internet yesterday. I didn't even discuss it! How could I? "Captain Marvel" is going to be a big building block for the future of this franchise. 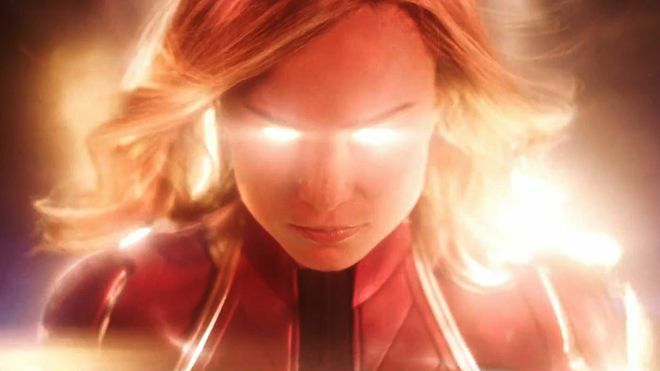 For one, this is Marvel's first female led film. Its also going to be a huge puzzle piece to where this story will be going after all the Thanos funny business is taken care of. Oh yes, the MCU is stopping after Infinity War. There are plans for the foreseeable future. From the sound of it, there is going to be big emphasis on space and the cosmos, which should be exciting. "Captain Marvel" will take place in the 1990's. If you couldn't tell from the trailer, Samuel L. Jackson returns as Nick Fury, but with hair, two eyes and a younger looking self. As does Clark Gregg returning as Phil Coulson. We also know that Lee Pace and Djimon Hounsou will return as Ronan and Korath from "Guardians of the Galaxy." But as our hero crashes into a 1990's styled Blockbuster Video, its pretty clear how serious they are taking this. Brie Larson will star as Carol Danvers who becomes Captain Marvel, and I think she looks great! Its a short trailer, and I have no idea of what the story will really be. But that's a good thing. I am getting tired of all trailers giving the whole movie away anyway!